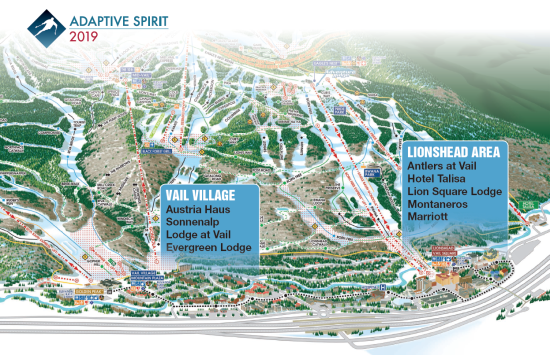 Adaptive Spirit has secured special rates at a number of Vail properties for AS2019. It is important to note, each property has different resort fees, parking and reservation policies so make sure you discuss these with the reservation agent when booking your room. Lodging and rates are based on current inventory and may become unavailable as the year progresses - information on this page will continue to change throughout the year. The Hotel Talisa has sold out! Adaptive Spirit has selected alternate lodging properties for you to consider based on location, preferred rates and their willingness to support Adaptive Spirit with Silent Auction donations. Please contact the locations listed below directly for any questions or reservations and don't forget to mention Adaptive Spirit to receive the special AS2019 rates! In addition to hotel rooms, the Hotel Talisa manages a number of condominiums and private homes in close proximity to the hotel. These units include one-bedroom condos to five-bedroom homes ranging in price from $350 to $1,000 per night. Unit details are available at the Condo web site. Please contact the reservation office at 970-479-1528 to receive rates and availability. Make sure you mention Adaptive Spirit for the best rates. You can also book online using the code "ADAPTIVE19". The Antlers at Vail hotel offers a lodging experience on beautiful Gore Creek. Just 150 yards from the Lionshead Gondola, accommodations enjoy a full kitchen, private balcony, daily housekeeping and WiFi. In addition, the rates quoted include a parking space and passes to the Vail Athletic Club. For reservations, call 800-843-8245 and refer to Leader #177341 to receive these special rates. Only yards from the Eagle Bahn Gondola, the Vail Marriott has extended a special rate to our group. Complete information and the ability to book online is available on the Vail Marriott web site. You may also call 877-622-3140 and ask for group reservations - make sure you mention Adaptive Spirit to recieve this rate. Lion Square Lodge is located at the base of Vail Mountain in Lionshead Village. It offers a premier ski in/ski out location adjacent to the Eagle Bahn Gondola. Lodge rooms start at $239 and condominiums at $318. Rates vary based on unit type and location (mountain view, valley view or north building). Complete information is available on their web site. For reservations, call 877-613-2104 and mention Adaptive Spirit for the best rates. Montaneros is located in the heart of Lionshead Village. Its condominiums come complete with first-class service, in-room luxuries and on-site amenities. Complete information is on their web site. Call reservations at 800-444-8245 and tell them you are with Adaptive Spirit for the best rates. Located centrally in Vail Village, the Austria Haus provides an option to enjoy the Village at a reasonable rate. The hotel's pedestrian village location provides convenient access to local attractions, dining, shopping, skiing and more. Austria Haus is within walking distance to a wide variety of celebrated Vail restaurants. Details are available at the Austria Haus web site. Call reservations at 800-859-8242 ext 1 and refer to Adaptive Spirit or group code VC1ADP to receive this preferred rate. The rate includes a daily continental breakfast. Back again this year is the favored Sonnenalp Resort. This property offers a variety of room types from a junior suite to two-bedroom suites. It offers exceptional dining, shopping and the pristine slopes of Vail close by in the heart of Vail Village. Amenities include gas log fireplaces, balconies, heated marble floors in bathrooms and nightly entertainment. Valet parking in a heated underground garage is available. Complete details are available on the Sonnenalp web site. Call reservations at 800-654-8312 and refer to Adaptive Spirit to receive this preferred rate. With renovations completed in 2018, this is Adaptive Spirit’s lowest priced lodging option. Conveniently situated between the Village and Lionshead, the Evergreen Lodge has a Town of Vail bus stop steps away from the property and the Adaptive Spirit shuttle stops there on a regular basis. Details about this property are available at the Evergreen Lodge website. Call the reservations line at 970-476-7810 or book online and tell them you are with Adaptive Spirit for these special rates. Nestled in the heart of Vail Village, these properties combine location and service with the classic ambiance of an alpine-inspired hotel. The hotel's pedestrian village location provides convenient access to local attractions, dining, shopping, skiing and more. Guests will enjoy its luxurious spa, fitness center, skier service center and more. Details are available at the Lodge at Vail web site or call to reservations at 800-859-8242 ext. 1 and refer to Adaptive Spirit or Group Code VC1ADP to receive this preferred rate.